Since the first release of the JIDE Docking Framework in November of 2002, our products have been warmly welcomed by the Java/Swing community. Javalobby's newsletter covered the JIDE Docking Framework as a head-line story and highly recommended it as a "must-have tool for great Java client application development". It was also featured in Swing Sightings,volume 16. Now, we have 17 products and are getting very close to the goal of providing a complete solution for rich client applications, to make your client side development easier and easier. 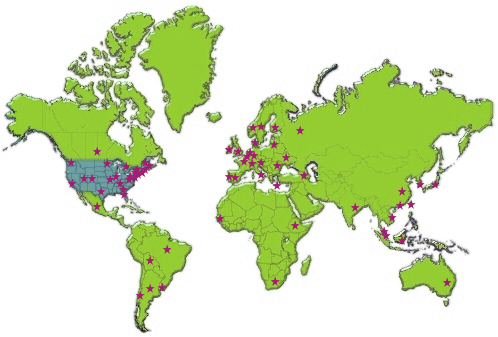 Even though our company is still very young, we already have over 2000 customers in 70 different countries and areas. They represent a very wide variety of industries, showing that our solutions are valuable in many different situations. You can read on to see a partial list of our customers. You can also read here to see what they think of our products. * On U.S. map, each star indicates there are customer(s) in that state. Chengdu Alcatel Communication System Cor., Ltd.
FQS Poland Sp. z o.o. Global Bay Mobile Technologies, Inc.
NARI Technology Development Co., Ltd.
Petrobras - Petr�leo Brasileiro S.A.
Snecma Aerospace India Pvt. Ltd.
Zhejiang Creaway Automation Engineering Co., Ltd.